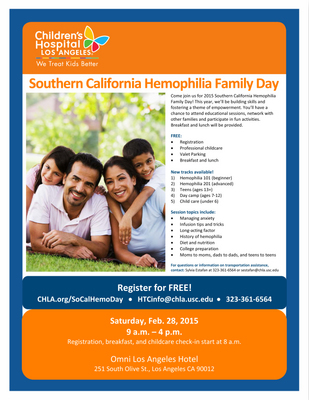 Come join us for 2015 Southern California Hemophilia Family Day! This year, we'll be building skills and fostering a theme of empowerment. You'll have a chance to attend educational sessions, network with other families and participate in fun activities. Breakfast and lunch will be provided. Robert Champagne, President of the C.J. Wilson's Children's Charities will be co-facilitating the Dads to Dads Meeting. It's an informal facilitated discussion group with male caregivers of people with Hemophilia.